Headed home! 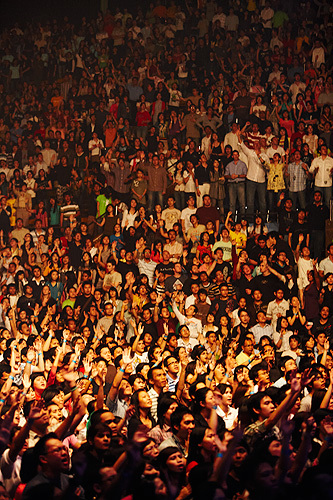 Passion Jakarta was…um, well…words just cant describe! Simply Amazing!! We are thrilled with how well the gathering went. We had a packed house of 7,000 beautiful Indonesian college students worshipping and it was incredible! It all seems a bit of a whirlwind as we are already back in Seoul tranfering planes to head to the ATL. After touching down in Atlanta, I’ll hop on another flight to pick up Nash. I CAN NOT wait to hold my little boy! I talked to Olivia for a few minutes earlier this morning and she told me that Nash is officially walking!!! He can walk across the room!! I can’t believe how much can change in one week. When I left last week he would take 3-4 steps but then fall on his bum and laugh. So excited! Looking forward to seeing Nash in less than 20 hours! Here is a snapshot of Passion Jakarta…check out http://www.268Blog.com if you want to read more about it and see more pictures. Simply AMAZING…so humbled to have had a small part in it.